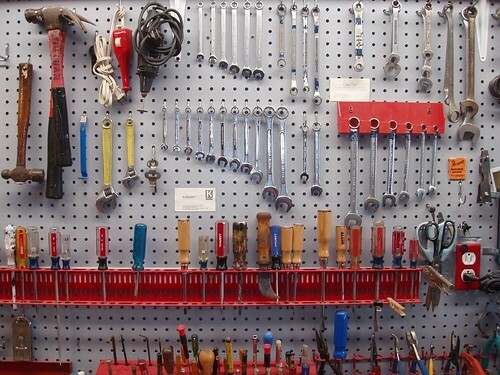 You can search online to find a pegboard to better organize your tools. Now that summer is here, it’s a great time to finally get going on some of those home improvement projects you’ve been putting off since last fall. If you’re reorganizing closets or renovating toolsheds, you might find yourself on the hunt for a pegboard to help you reach your renovation goals. Pegboards are surprisingly versatile tools that can make a huge difference with relatively little effort. Pegboards can turn a cluttered workbench into a beautiful, organized wonderland of wrenches and drill bits, and they can also free up space you never knew you had. If you thought your garage was a lost cause thanks to the lawnmowers and chairs that you’ve accumulated over the years, how about hanging that gear from a pegboard? Actually, pegboards can be used all over the house—from decorating bedrooms to organizing kitchens to acting as pieces of furniture. Whatever your pegboard dreams are, you’ll need to determine where to buy a pegboard before you can get going on your home renovations. What will you be using the pegboard for? What type of material should the board be made out of? What size board do you need? When shopping for a pegboard, it’s a good idea to search around as much as possible. Since they’re generally sturdy and extremely reusable, pegboards are actually great products to buy used. Usually it’s the hooks that hang from the boards, not the boards themselves, that see most of the wear and tear, so you often will not even be able to tell the difference between a used pegboard and a new one. If you can, try to keep your eyes open for used boards before investing in new ones. If you’re wondering where to buy a pegboard, your first stop should always be online marketplaces or auction sites. Not only will you be more likely to find the best deal, but browsing online stores will also allow you to scope out all your options and determine which board will work best for you.